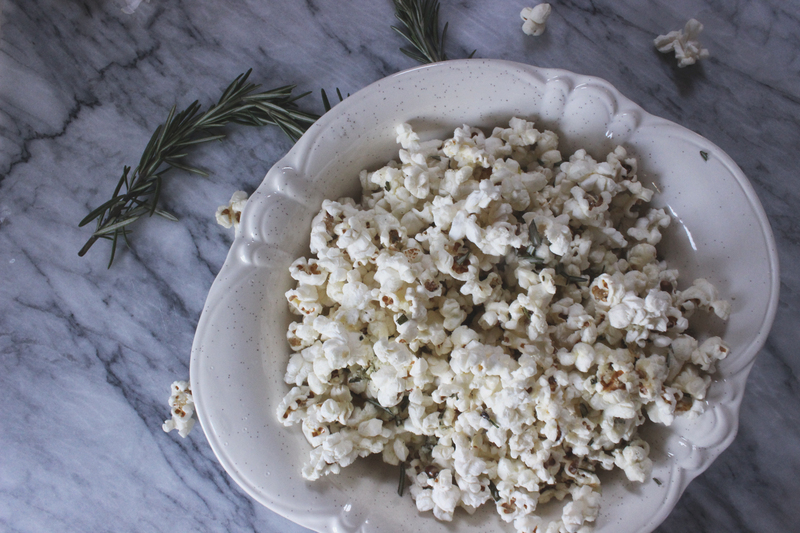 We knew we wanted to make Rosemary Parmesan Popcorn, but when we found this recipe to use as a guide, of course we had to add in the garlic! This savory little creation is a great light snack for those of you who love your evening munch-time! 01. In a small saucepan, melt the butter over medium-low heat. Stir in the garlic and fresh rosemary. Cook for 1-2 minutes, until garlic is lightly browned. Remove from heat and set aside. 02. To pop the popcorn, heat the canola oil in a 3-quart saucepan on medium high heat. Put a couple popcorn kernels into the oil to see if it is hot enough. If they pop, then it’s ready. 03. Add the popcorn kernels in an even layer. Cover the pan with a lid, remove from heat for about 30 seconds. Return the pan to the heat and gently shake the pan by moving it back and forth over the burner. You will hear the popcorn popping. Keep the lid slightly ajar so the steam can escape. If you remove the lid completely, you will have a popcorn mess. When the popcorn is done popping, remove the pan from the heat. Pour the popcorn into a large bowl. 04. 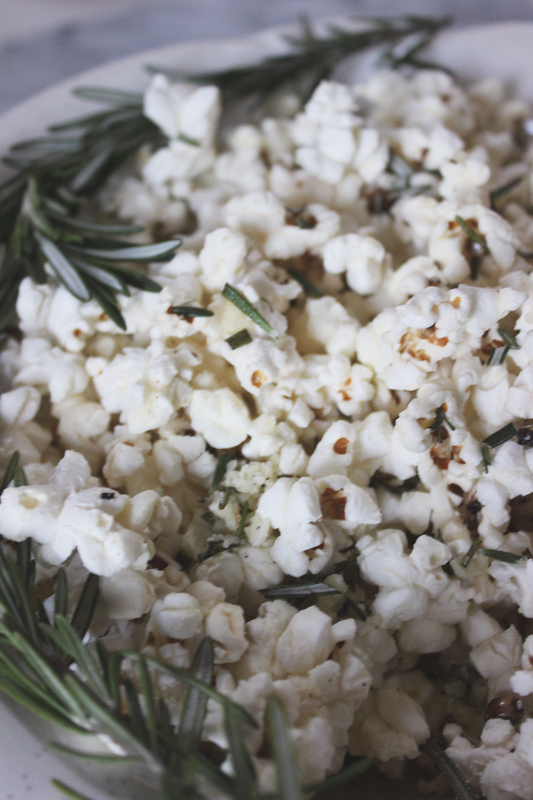 Pour the butter,garlic, and rosemary mixture over the popcorn and gently toss. 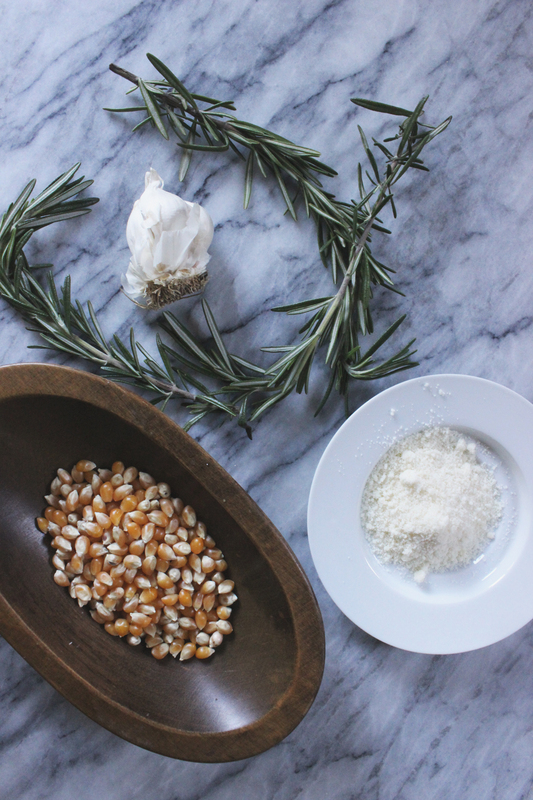 Sprinkle Parmesan cheese over the warm popcorn. Season with salt, to taste. * Note — you can use microwave or air-popped popcorn if you wish. 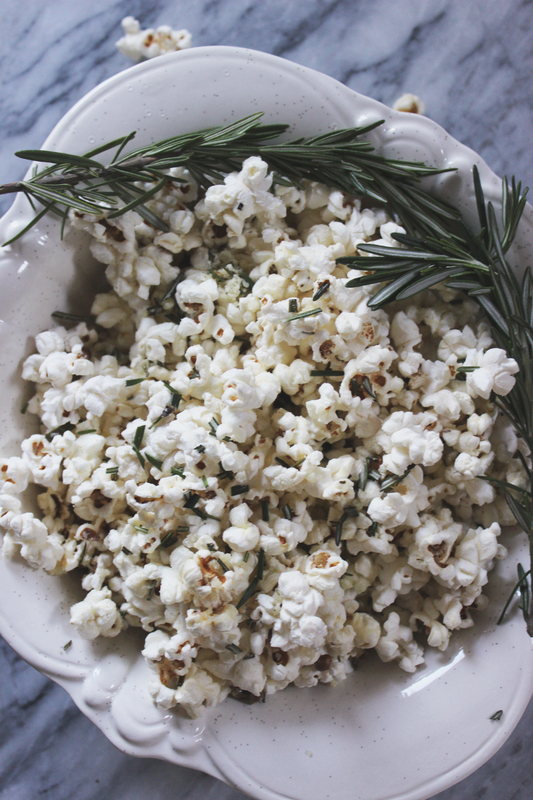 This entry was posted in Food, Home and tagged garlic, Good Eats, Parmesan, Popcorn, Rosemary, Rosemary Garlic Parmesan Popcorn, Snack time by Gardenias & Mint. Bookmark the permalink. This looks so delicious. I will definitely be making this tonight for a perfect evening snack! Thanks for sharing-the pictures are beautiful!